Measure Clean the squid and cut into 1-inch rounds; leave tentacles whole. Drain well and squeeze gently to remove any water that may be trapped inside the rounds. Let sit at room temperature at least 20 minutes before cooking. If the surface is still wet when you are ready to cook, pat dry with a clean towel. Pound the chillies and garlic with a mortar and pestle until pasty. Prepare the remaining ingredients as instructed. Heat a wok over high heat until it is smoking hot. Swirl in the oil to coat its surface and wait 10-15 seconds for it to heat. Add the chilli mixture and sauté until aromatic and the flavors well-blended. Toss in the squid. Stir-fry over high heat for about half a minute, or until the squid begins to loose its translucence. Add the slivered rhizome, kaffir lime leaves, holy basil, pepper slivers and green peppercorn sprigs. Stir-fry another minute and season to taste with fish sauce and sugar. Continue to stir-fry until all the squid has changed from translucent to opaque white and the pieces are curled along the edges. Transfer to a serving plate. Giving an English name to Thai dishes can sometimes be quite a challenge. Translating from the common Thai name doesn't always work. This stir-fry, for instance, is widely known as pad chah – pad means stir-fry and chah is the loud sizzling and splashing sound of food being tossed into a very hot wok. It conjures up an image of excitement in the kitchen. 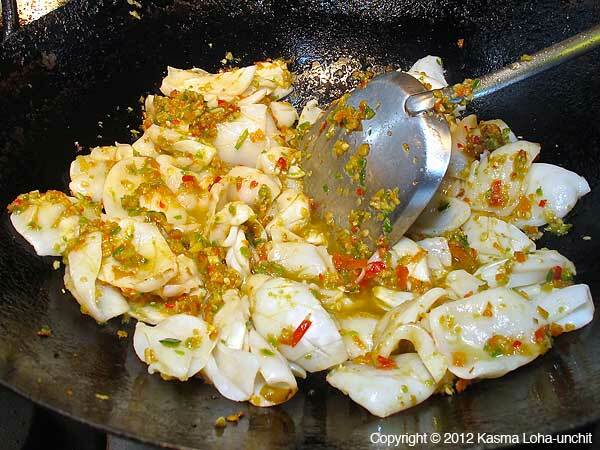 In addition, pad chah dishes are full of exuberant flavor, giving diners a joyful lift. 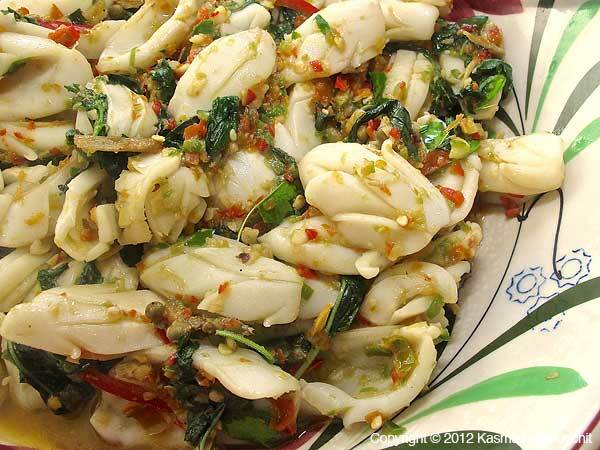 This recipe of pad chah is particularly lively. Not only is it dancing hot with spicy heat, but is also profusely fragrant with three luscious herbs – holy basil, gkrachai (rhizome) and kaffir lime leaves. My husband loves the combination and has placed the recipe among his top ten favorite seafood dishes. He even makes a pretty mean pad chah on days when I am too busy to cook. It's an all around winner – easy to make, enlivening and so tasty. 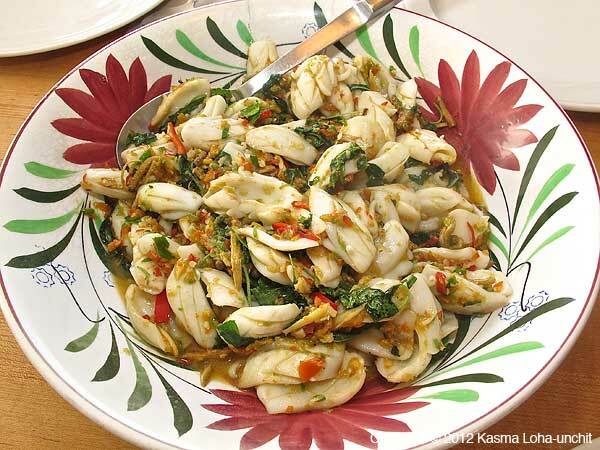 Cuttlefish is excellent cooked this way – buy the 2- to 3-inch size available in frozen bags from Asian markets. Score them to cook up into pretty patterned pieces. Also good with shrimp, scallops and chunks of firm, meaty fish, such as sturgeon, halibut, tuna and swordfish. I had it once with skate, which was first deep-fried in small thin slices until lightly crisped before tossing into the stir-fry. The pungent and perfumy qualities of gkrachai (rhizome) disguise the fishy odors of strong-tasting fish. Use the fresh or frozen roots; if these aren't available, substitute with the pickled kind in jars, or dried slivers reconstituted by soaking in warm water. The latter will not soften enough to eat and is concentrated, so use only half of what is needed. Kasma teaches this recipe in the Evening Series Advanced Set B-2. *Because the Thai language has its own script, there are different ways of transliterating Thai into English. The more phonetic version is Blpah Meuk Pad Chah; the more usual spelling is Pla Meuk Pad Cha. See A Note on Thai Pronunciation and Spelling.